Polymer nanocomposites mix particles billionths of a meter (nanometers, nm) in diameter with polymers, which are long molecular chains. Often used to make injection-molded products, they are common in automobiles, fire retardants, packaging materials, drug-delivery systems, medical devices, coatings, adhesives, sensors, membranes and consumer goods. When a team led by the Department of Energy's Oak Ridge National Laboratory tried to verify that shrinking the nanoparticle size would adversely affect the mechanical properties of polymer nanocomposites, they got a big surprise. "We found an unexpectedly large effect of small nanoparticles," said Shiwang Cheng of ORNL. The team of scientists at ORNL, the University of Illinois at Urbana-Champaign (Illinois) and the University of Tennessee, Knoxville (UTK) reported their findings in the journal ACS Nano. Blending nanoparticles and polymers enables dramatic improvements in the properties of polymer materials. Nanoparticle size, spatial organization and interactions with polymer chains are critical in determining behavior of composites. Understanding these effects will allow for the improved design of new composite polymers, as scientists can tune mechanical, chemical, electrical, optical and thermal properties. Until recently, scientists believed an optimal nanoparticle size must exist. Decreasing the size would be good only to a point, as the smallest particles tend to plasticize at low loadings and aggregate at high loadings, both of which harm macroscopic properties of polymer nanocomposites. The ORNL-led study compared polymer nanocomposites containing particles 1.8 nm in diameter and those with particles 25 nm in diameter. Most conventional polymer nanocomposites contain particles 10-50 nm in diameter. Tomorrow, novel polymer nanocomposites may contain nanoparticles far less than 10 nm in diameter, enabling new properties not achievable with larger nanoparticles. Well-dispersed small "sticky" nanoparticles improved properties, one of which broke records: Raising the material's temperature less than 10 degrees Celsius caused a fast, million-fold drop in viscosity. A pure polymer (without nanoparticles) or a composite with large nanoparticles would need a temperature increase of at least 30 degrees Celsius for a comparable effect. "We see a shift in paradigm where going to really small nanoparticles enables accessing totally new properties," said Alexei Sokolov of ORNL and UTK. That increased access to new properties happens because small particles move faster than large ones and interact with fewer polymer segments on the same chain. Many more polymer segments stick to a large nanoparticle, making dissociation of a chain from that nanoparticle difficult. "Now we realize that we can tune the mobility of the particles—how fast they can move, by changing particle size, and how strongly they will interact with the polymer, by changing their surface," Sokolov said. "We can tune properties of composite materials over a much larger range than we could ever achieve with larger nanoparticles." The ORNL-led study required expertise in materials science, chemistry, physics, computational science and theory. "The main advantage of Oak Ridge National Lab is that we can form a big, collaborative team," Sokolov said. Cheng and UTK's Bobby Carroll carried out experiments they designed with Sokolov. Broadband dielectric spectroscopy tracked the movement of polymer segments associated with nanoparticles. Calorimetry revealed the temperature at which solid composites transitioned to liquids. Using small-angle X-ray scattering, Halie Martin (UTK) and Mark Dadmun (UTK and ORNL) characterized nanoparticle dispersion in the polymer. To better understand the experimental results and correlate them to fundamental interactions, dynamics and structure, the team turned to large-scale modeling and simulation (by ORNL's Bobby Sumpter and Jan-Michael Carrillo) enabled by the Oak Ridge Leadership Computing Facility, a DOE Office of Science User Facility at ORNL. "It takes us a lot of time to figure out how these particles affect segmental motion of the polymer chain," Cheng said. "These things cannot be visualized from experiments that are macroscopic. The beauty of computer simulations is they can show you how the chain moves and how the particles move, so the theory can be used to predict temperature dependence." Shi-Jie Xie and Kenneth Schweizer, both of Illinois, created a new fundamental theoretical description of the collective activated dynamics in such nanocomposites and quantitatively applied it to understand novel experimental phenomena. The theory enables predictions of physical behavior that can be used to formulate design rules for optimizing material properties. Carrillo and Sumpter developed and ran simulations on Titan, America's most powerful supercomputer, and wrote codes to analyze the data on the Rhea cluster. The LAMMPS molecular-dynamics code calculated how fast nanoparticles moved relative to polymer segments and how long polymer segments stuck to nanoparticles. "We needed Titan for fast turn-around of results for a relatively large system (200,000 to 400,000 particles) running for a very long time (100 million steps). These simulations allow for the accounting of polymer and nanoparticle dynamics over relatively long times," Carrillo said. "These polymers are entangled. Imagine pulling a strand of spaghetti in a bowl. The longer the chain, the more entangled it is. So its motion is much slower." Molecular dynamics simulations of long, entangled polymer chains were needed to calculate time-correlation functions similar to experimental conditions and find connections or agreements between the experiments and theories proposed by colleagues at Illinois. 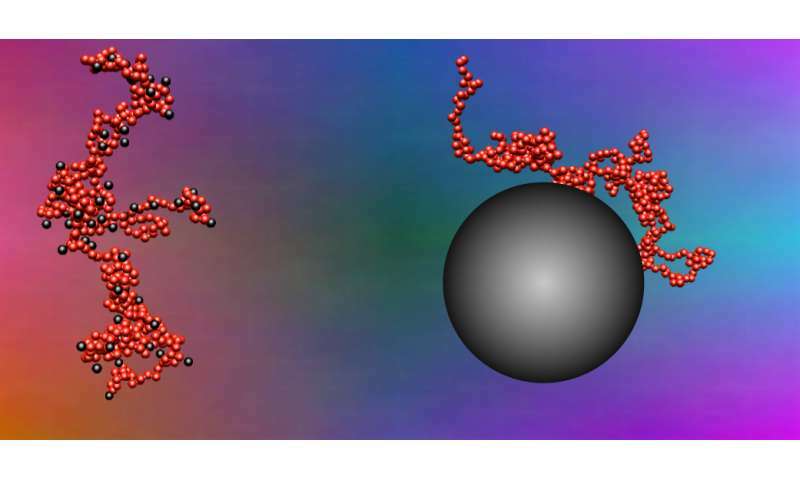 The simulations also visualized how nanoparticles moved relative to a polymer chain. Corroborating experiment and theory moves scientists closer to verifying predictions and creates a clearer understanding of how nanoparticles change behavior, such as how altering nanoparticle size or nanoparticle-polymer interactions will affect the temperature at which a polymer loses enough viscosity to become liquid and start to flow. Large particles are relatively immobile on the time scale of polymer motion, whereas small particles are more mobile and tend to detach from the polymer much faster. The title of the paper is "Big Effect of Small Nanoparticles: A Shift in Paradigm for Polymer Nanocomposites."